The plans involve milling the pavement (removing the surface to smooth out irregularities and create a uniform depth) and then installing a temporary surface that will be re-striped with limited and temporary markings. These temporary markings are only going to include a double yellow center line and dashed white lines that will make the travel lanes clear. The city urged cyclists to consider taking this alternate route, which has riders taking St. Botolph Street to West Newton Street across Huntingon Avenue, where the road turns to Belvidere Street and then turning onto Dalton Street at the Belvidere/Dalton Plaza. When the initial phase of construction is complete, then the city will re-pave and stripe the road with the final markings. The construction is part of a larger initiative, Vision Zero Boston, which outlines the city’s commitment to funnel resources on traffic safety strategies with the goal of slashing serious and fatal crashes in the city to zero by 2030. Mass. Avenue has been the site of numerous serious and deadly bicycle accidents in Boston, so the construction is definitely welcome. However, it may create more hazards in the short-term. That’s because construction zones are often not designed for safe passage of bicycles. At best, construction work can slow you down. But riders need to consider their own personal safety as they maneuver through narrow lanes, poor riding surfaces, large equipment, workers, dust and debris and impatient drivers. Taking the alternate route may mean adding a few extra miles to the trip, but it may be well worth it in order to keep yourself safe. For those who may be unable to avoid traveling along at least part of Mass. Ave. during the construction, there are a few things to keep in mind when biking through a construction zone. One bit of good news is that because bikes are smaller, they can often fit in where cars may not. Still, when in doubt, walk your bicycle, especially where there is gravel or soft shoulders, which can be dangerous for skinny tires normally used in city cycling. Another potential hazard is being struck by construction equipment. 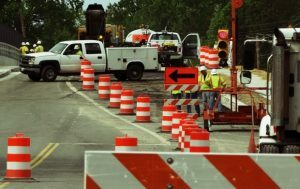 Make sure as you make your way through the work zone that you make eye contact with equipment operators. Bicycles are foreign objects in a construction zone and workers might not be expecting you. Wave. Make yourself known. Also be mindful of the backup alarms on the equipment, as this alerts you of danger. Don’t assume the operator can see you or will use appropriate caution. Finally respect the signs, obey the foreman/ flagman’s directions and ride defensively.